Pancakes are my FAVORITE breakfast food! Okay, maybe one of my favorite foods in general… but how can you include veggies in your breakfast if you are eating pancakes?? Most people don’t eat vegetables in the morning which is obvious when hearing the statistic “only 9% of Americans get the needed 2-3 cups of vegetables per day” – say what? Well, this recipe is simple and a good way to include a veggie & a fruit to start your day off right! Non-stick cooking spray Add in slivered almonds, chopped walnuts, or hemp seeds, too! Grate zucchini and squeeze out water with a paper towel (I usually squeeze it about 3 times, it will still probably feel very wet). Mix zucchini with egg and soy milk. Add in the pancake mix. Heat skillet, spray non stick cooking spray, and pour batter onto hot pan. 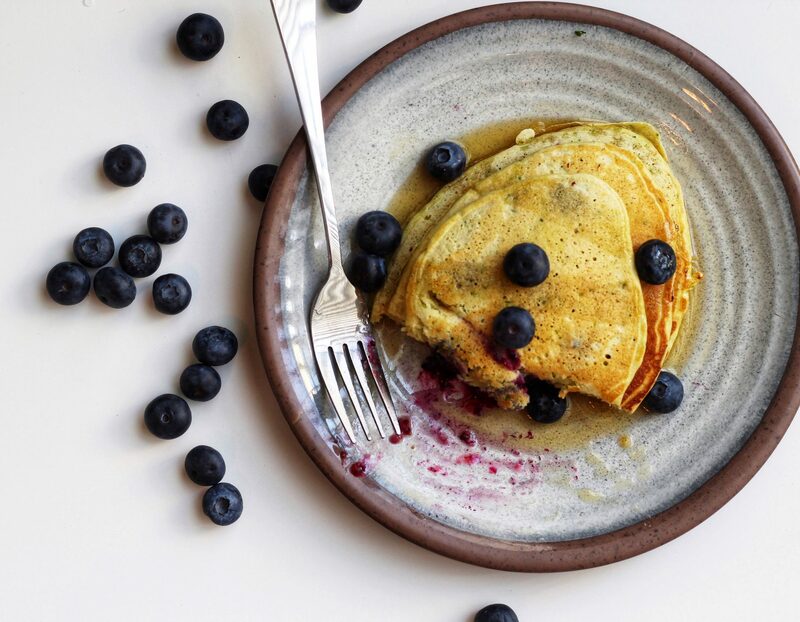 Place blueberries and nuts/seeds immediately in hot cakes. Once bubbles arise flip the cakes – leave for a couple of minutes. Top with Brandless maple syrup plus blueberries & nuts, if desired! Join my mailing list to receive monthly newsletters, new specials, and more!